Having said that, my friends are having hard time getting few even “keeper” sized fish regardless if they are in MA or NJ. To some of you who are younger, I would offer the advice to fight for what you believe in when it comes to striped bass conservation. 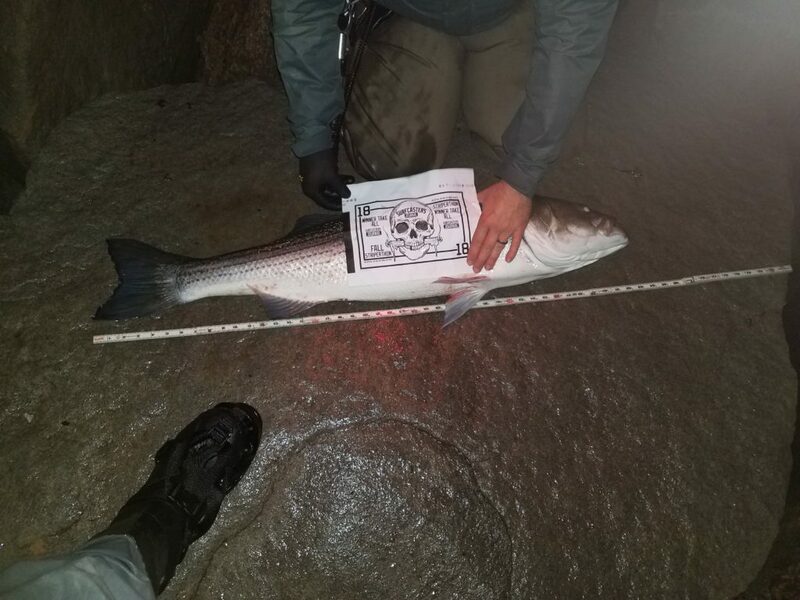 A lot has changed in the society since we fought for striped bass on the verge of collapse many years ago. What it hasn’t changed is the attitude of commercial and for hire sectors who still think that ocean is a bottomless pit God put on this Earth so they can pay their bills and vacation in FL in the winter. Yeah, they are some very good eggs in that business, but most are rotten to the core, and would kill a last fish in the ocean to make a buck that day. Congrats to Jared. I was out trying but the bass eluded me. Only had keeper fluke with another surfcasters journal member and mullet that kept hitting the lures. On the same thought that Zeno started, The commercial, “for hire guys”, and their customers that take all the fish they can always seem to be the first ones complaining when there are no bass. The customers aren’t seen by the charter guys when there are no fish to catch so bookings for fishing trips drop. The commercial guys start going for other fish species than their numbers drop. I was getting e-mails from a well known tuna charter boat that showed countless numbers of tuna hanging and always the full limit they could take for the number of anglers they had. They were all large tuna at 100+ pounds each. How much tuna can you eat and freeze.? I e-mailed them and said that maybe they should do more catch and release because sooner or later tuna are going to be depleted in numbers and people aren’t going to spend money on fishing if the chances are good that they aren’t going to get a tuna. The answer to me was to remove me from their e-mailing list. Someone was probably selling / buying those tuna at the dock. Thanks for putting on the tournaments, my first year doing it. Fished hard biggest I came up with was 32″. Congrats Jared, very nice fish! I had several teen sized fish but nothing close to a 43 inch fish so I didn’t submit any entries as it was winner take all. Zeno, best of luck in the marathon ! What a great cause ! Maybe in the future a surf tournament with a entry fee to benifit Autism research. I’d definitely be in! Congrats to the winner!! 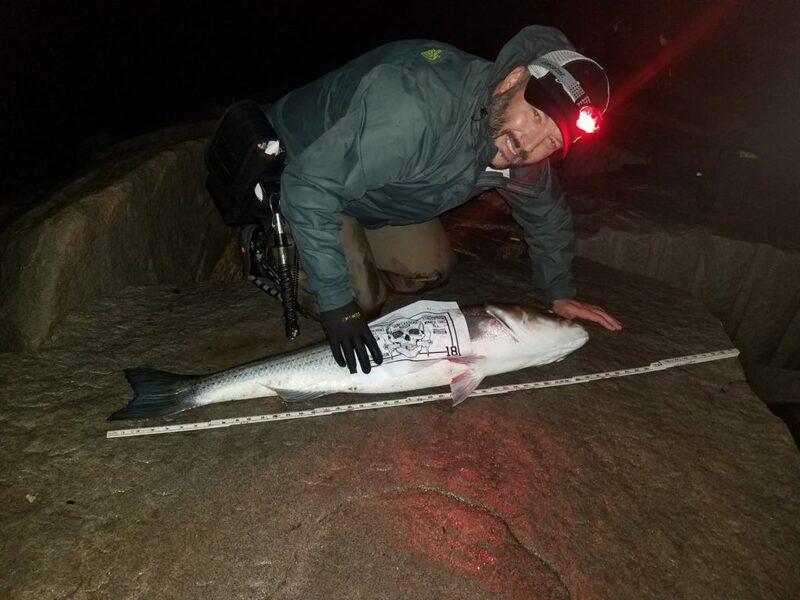 I don’t think we’ll have a complete collapse of the striper bass stock like we did in the early 1980s, but the days of widespread great fishing might be over as well. We’ve had some very good spawns in recent years (and some terrible ones). We do have are schools of large cows concentrated in a few areas. If you’re in that area, it looks like everything is great. What we don’t have are many stripers in between, or many fish between the “very large” and “small” classes. The fishing pressure is so intense that it’s hard to see having a boom period like we had in the 2000s. I hope I’m right that it also won’t go bust. I also agree that a charity event for autism research is a great idea for next year. Congrats on hitting your $3500 goal! I know you don’t want to burn spots but how about some info on where and what it was caught with, lure or bait etc.